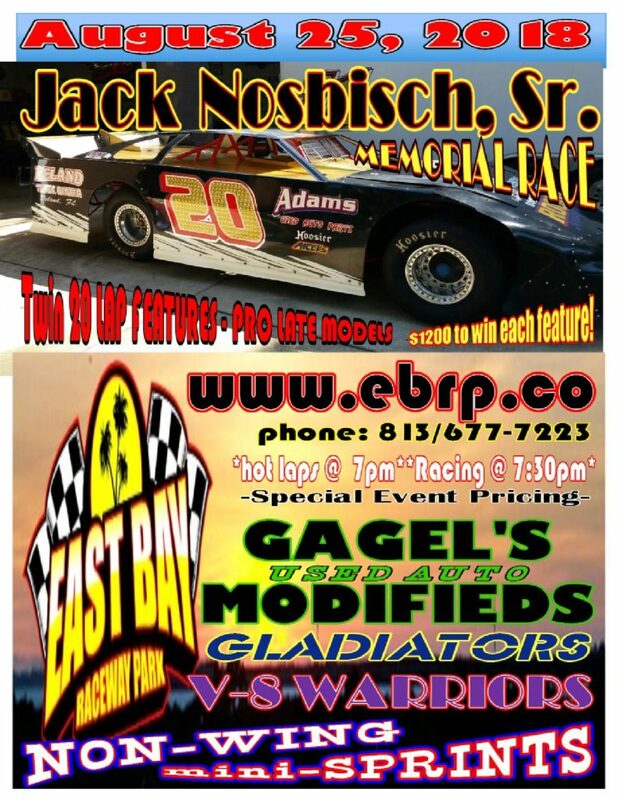 After a one-week break mandated by Mother Nature, East Bay Raceway Park returned to action on a hot summer Saturday night. Many of the drivers on hand worked hard to get their equipment in top shape and it showed with some great performances. 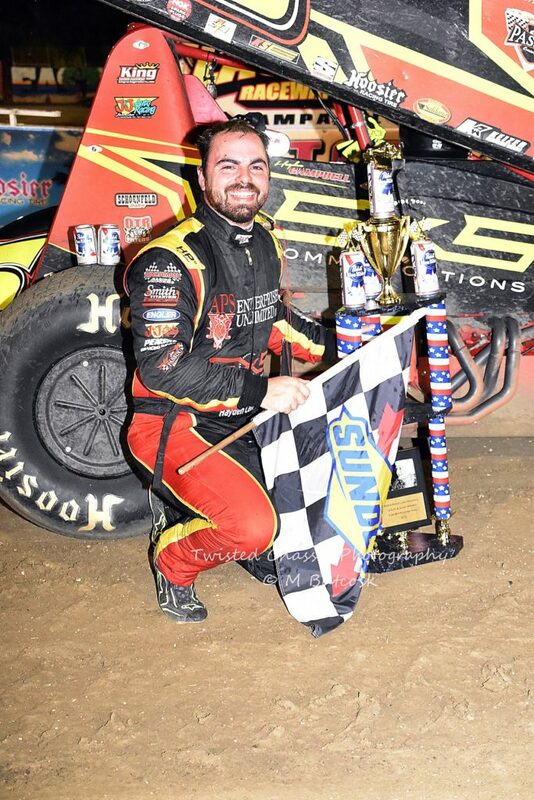 Jerod Meyers picked up his first feature victory of the 2018 season, dominating the competition in the 12-car Micro Sprint class. Meyers becomes the third different winner of the year and the victory will help move him into the top 10 with a lot of racing still on the schedule. John Bradley made an outside pass to win his heat race, then repeated the feat in the feature to claim victory there. Bradley slipped past early race leader Matt Bozeman and set sail for the 15-lap win. It was Bradley’s second feature victory as the current points leader now has 8 top five finishes in 9 starts. Gonzo Godwin got the best of the field in the Florida Old Time Modified 12-lap main. Dan Darnell made a late race charge, but fell just short as the laps wound down. Hayden Campbell is no stranger to East Bay’s victory lane and he made a return visit tonight in the Bob & Marge Long Memorial 25-lap main event for the Q Auto & Injury Attorneys Sprints. Campbell shot to an early lead and encountered lapped traffic on lap 3. Campbell was able to slide by, but a hard charging Robbie Smith was not as fortunate, making contact and taking a tumble. Smith was OK, but clearly disappointed. On the subsequent restart, Billy Boyd and Andy Kelly made contact, resulting in Boyd flipping in turn one as the red flag returned. Once the race went green, it stayed that way until a lap 20 caution for 2017 East Bay Sprints champion Justin Webster who stopped on the track. Campbell now had his hands full with Sport Allen’s effort, using the higher line to seek an advantage. There was none to be found as Campbell cruised back to Victory Lane. The night’s action concluded with a last lap shootout in the Gladiators between race leader Daniel Casey and challenger Daniel Bowman. Bowman took the lead momentarily after a lap 12 restart, but caution flew again, putting Casey in control. 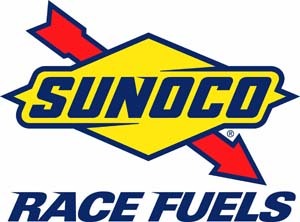 The two renewed the battle through the last laps. Casey had the lead off turn four, but contact with Bowman got him sideways and Bowman was able to squeeze across the line in front. Posted in Uncategorized on August 19, 2018 by admin.